KESAR or SAFFRON is one of a very old and famous spices come from a flower called Crocus sativus which is commonly known as saffron cocrus. From very old days people use this in food to bring a nice yellow color and flavor. Previously in my many post I used this saffron but never added saffron in any Non – Veg preparation before. 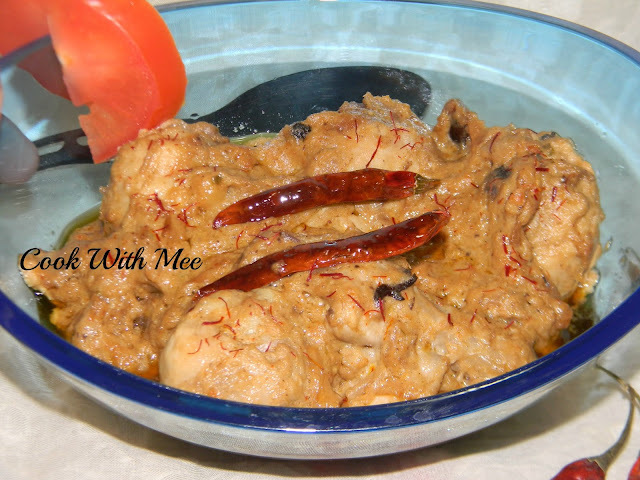 But last night I prepared one Chicken preparation with Saffron and named it KESARIYA MURG OR SAFFRON CHICKEN. 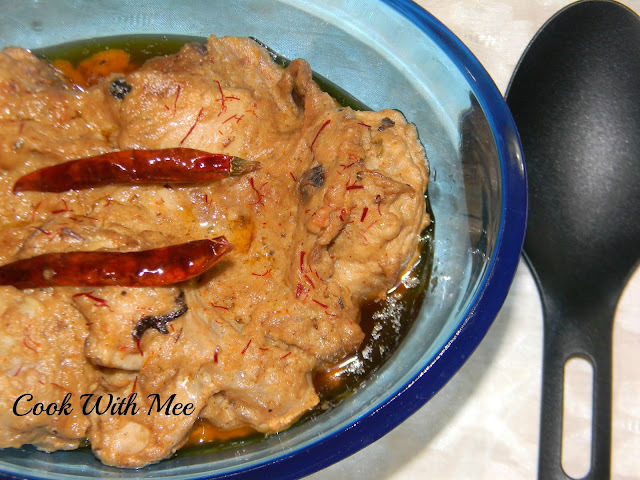 Few normal ingredients but this saffron made the dish extraordinary. Previously I thought it’s not going to work together in gravy, but believe me I am so wrong the dish was awesome. It feels great when I experiment with new stuffs and get a positive result. 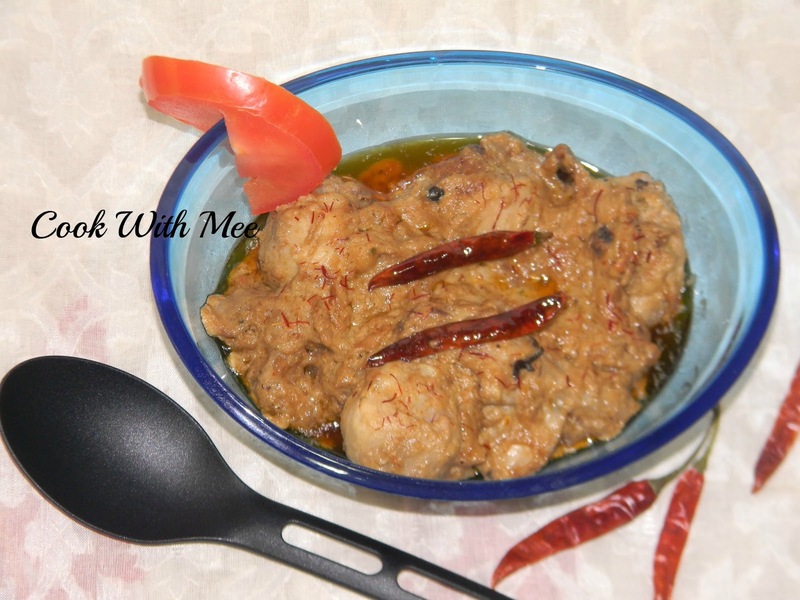 Chicken with a new twist is always a hit item in my home hope it will be same for all of you. 1.Chicken : 500 gm (boneless or with bone u can use any one). 3.Four to five clove minced garlic. 4.Two table spoon tomato and green chili paste (I use half tomato and two green chilies). 5.Half tea spoon red chili powder, A pinch of cinnamon powder. 6.Few saffron stands soaked in Luke warm milk. 7.Few coriander seeds, few cumin seeds, few black pepper (dry roast and make a fine spice powder in grinder). 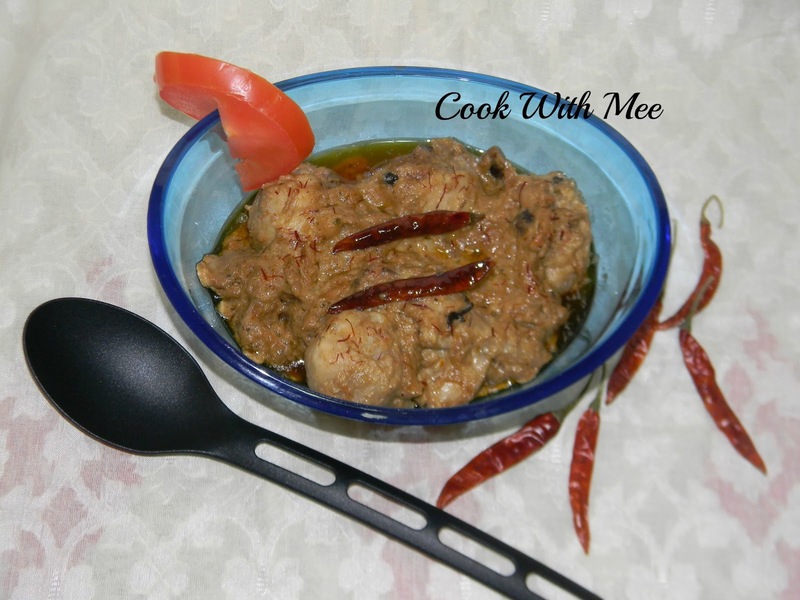 8.One table spoon cashew nuts paste. 9.One table spoon heavy cream. 10.Two dry red chilies, 2 to 3 cloves. Wash and clean the chicken pieces, now marinate the chicken pieces with some salt, cinnamon powder, red chili powder and minced garlic. Now add the cashew nuts paste into that saffron soaked milk and keep it aside. Now add some oil in a vessel and add the chopped onions and fry till they become transparent. Now add the chicken pieces and stir for some time. Now add the tomato and green chili paste and stir till the oil come out. Now add little warm water and cook with a lid for 5 mints. Now add the saffron soaked cashew nuts paste with milk and some sugar, mix well. Cook with a cover for another 5 to 8 mints. Now remove the lid and add the dry roasted powder and some salt, mix well. In a different pan add the ghee and fry the red chillies and cloves. Now add the fried red chilies and the cloves into the top of the chicken gravy.